In 1859, ex-East India Company smuggler Merrick Tremayne is trapped at home in Cornwall after sustaining an injury that almost cost him his leg. On the sprawling, crumbling grounds of the old house, something is wrong; a statue moves, his grandfather's pines explode, and his brother accuses him of madness. Thus begins Merrick's expedition to Peru in search of quinine. Despite knowing that every previous attempt has resulted in death, he yearns to escape his English home and discover some truth about the tales of his father and grandfather concerning the fairy-tales he'd heard as a child. The further he explores, the more mysterious and magical the environment becomes. Until he meets Raphael, who claimed to have known his grandfather. How can that be when Raphael appears so young, and with Merrick's grandfather so long departed from this life? 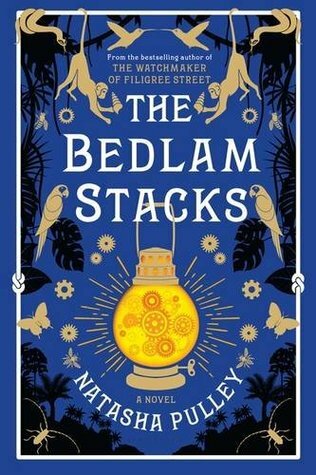 The Bedlam Stacks is the epitome of a slow-burning novel. In contrast to Pulley's initial venture in this trilogy, The Watchmaker of Filigree Street, it's pace is leisurely, serving to draw readers in slowly in order to acclimatise with the fantasy in parallel to Merrick's journey to deepest Peru. World-building in this novel is delicious and satisfying. We are presented with beautiful descriptions and smooth character development, with a smattering of cameo appearances from Pulley's earlier work. I believe this is the second of a trilogy of novels set in he same universe. Those who loved The Watchmaker will not be disappointed having reached the novel's conclusion, though may feel a little different about the method used to get there. I did truly enjoy this book, which I was invited to read for free as an ARC from the publisher. While it took a while to get going, I was enthralled when it did and felt a sense of loss as Merrick's story came to a close. Natasha Pulley is cementing her reputation as an author to watch out for. I sincerely cannot wait to read her third novel and see how the characters and threads return for the final story.